Well, it’s December, and that means every music reviewer online is posting their Best of the Year lists. I believe it’s a rule. It’s a mandatory thing. Still, I really do enjoy looking back on all the music of the year and revisiting my favorites. And really, that’s what most lists come down to: favorites. I mean, I can call this list the Best of 2017, but really, these are just my personal favorites. And of course, all of our personal tastes are different, so the albums I’d include on my list may not be the same as yours. And on top of that, there’s albums, artists or genres that don’t appeal as much to my personal taste that aren’t going to make my list as a result. One prime example is Kendrick Lemar. If you’ve been reading this blog for any amount of time, you probably figured out that rap isn’t necessarily my thing. 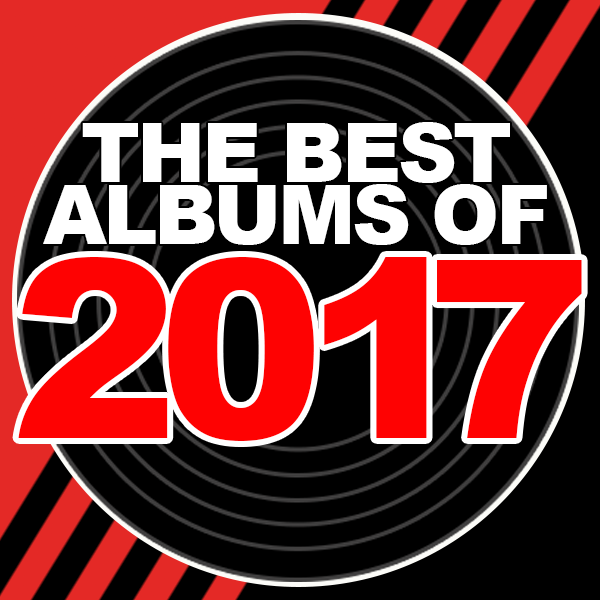 A lot of 2017 lists have Kendrick Lemar’s Damn ranked as one of the best albums of the year. And let me tell you, I listened to it. I could hear why it would appeal to a lot of listeners. But it’s not for me. I’m not saying it’s good or bad, I’m just saying it’s not for my personal taste. But because the album seems to be on everybody else’s year end lists, I feel like you should know why it’s not on mine. Finally, before we dive into my list, I want to say that I am 100% positive I’ve missed some great music in 2017 that I just didn’t get a chance to listen to. Albums that if I had heard them might very well have found a place on this list. So if I don’t mention one of your favorites, be sure to leave a recommendation in the comments below. As 2018 begins, I’d love to catch up on music I may have overlooked. So without further delay, let’s kick things off with the album that lands at number ten on my list of the best albums of 2017. It’s Matthew Sweet with Tomorrow Forever. Matthew Sweet holds a position of unique, albeit personal distinction on this list, as he is the only artist in the top ten that has ever released an album I’d consider to be one of my desert island discs. If I was stranded on a desert island with a presumably solar powered CD player, I’d want Matthew Sweet’s 1991 album Girlfriend right there with me. Sweet released a series of great albums during the 1990s, but I haven’t found his solo work during this new millennium to be as strong. That’s why this year’s Tomorrow Forever was so refreshing. Matthew Sweet is back in top form on this album, which features the kind of retro songcraft and layered vocal harmonies that helped him breakout on college radio 25 years ago. It’s a welcome return! And speaking of welcome returns, at number nine we have LCD Soundsystem American Dream. After the band’s 2010 album, James Murphy announced the group was breaking up and staging a farewell concert at Madison Square Garden. Most fans were skeptical, though, and held out hope for a reunion. Then in 2017 to the surprise of almost no one, LCD Soundsystem reunited for American Dream. I reviewed this album when it first came out, and I talked about how I think the band is just a bit over-rated. I still think that’s true, but it doesn’t stop me from putting this album in my top ten of the year. But at number nine. Because that’s where it belongs. The album at number eight on the list technically came out in 2016 in Europe, but it didn’t see an American release until 2017. Lost On You by LP really blew me away when I first heard it. I really love the unique tone in LP’s voice, and the songwriting is also really strong. And while LP is hardly a household name as a singer, she’s managed to write songs for superstars like Rihanna and Christina Aguilera, so she’s been around the block, so to speak. That being said, this album rocks in ways I’d never expect based on the artists she’s worked with in the past. I’m still surprised Lost On You didn’t make bigger waves in 2017, but hopefully she made enough of an impression on fans like me that her next album could be a real breakthrough. At number seven in my top ten of 2017 is the very first album I reviewed on the Track X Track YouTube channel. When Brand New surprise released Science Fiction earlier this year, I was taken aback. Not because I wasn’t expecting the album but because I’d never even listened to this band before, barely knew they existed, and was suddenly inundated with excited news posts about the band’s return. What had I been missing? A lot, it turns out! And I’m kind of kicking myself for that now. But I was happy to discover that this album lived up to the hype. New artist Phoebe Bridgers comes in at number six with her debut full length album, Stranger In The Alps. This had been one of my most anticipated releases of the year, after hearing the early singles and checking out her 2016 EP. I was actually getting worried that I’d feel disappointed when the album finally came out. Thankfully, Stranger In The Alps was as good as I’d hoped it would be. This year and last year, Bridgers has toured with Julien Baker, a singer songwriter with a similar style. Baker’s album Turn Out The Lights has found a place on a lot of year end lists, which is not undeserved. But I’m disappointed more of those listeners didn’t latch on to Phoebe Bridgers’ album as well. So if you’re a Julien Baker fan and you haven’t given Phoebe Bridgers a listen yet, please do so. You’ll be glad you did. I’ve got one more new artist on my list this year. At number five, it’s Jay Som with Everybody Works. Jay Som is actually a sort of one man band… or one woman band, to be more accurate. After a visit to the Wu-Tang name generator, Melina Duterte became Jay Som, who went on to perform every instrument on her 2017 album. Everybody Works is an intimate rocker, if that makes any sense. The music draws you in. It feels innately personal. And while none of the instrumentation is at all flashy, the song “One More Time, Please” features one of my favorite guitar solos in a long time. It’s not epic or in your face, it’s just… right. And that’s kind of how this whole album hit me. It is just… right. At number four, it’s Jason Isbell and the 400 Unit with The Nashville Sound. I have a strange relationship with Jason Isbell. For some reason, I’ve tried to resist his music. I discovered him with his 2013 album, Southeastern, an album I really enjoyed. But when his follow-up came out in 2015, I didn’t check it out right away. When I did, though, I was once again impressed. So how did it let this happen yet again in 2017? When The Nashville Sound came out in June, I waited about a month before listening. And you know what? (Of course you know. You knew before I did!) It’s great! It’s my number four album of 2017. Moving on to number three… When Lorde’s Pure Heroine came out in 2013, the impact was huge. There was a sound to her music that was unlike anything we were hearing at the time. She had an intimate style of singing and songwriting that seemed to be in stark contrast to the level of success her debut album achieved. And on top of that, she was only 17 years old! Now, I’m sure I wasn’t alone in thinking she wouldn’t be able to duplicate that album with her 2017 sophomore effort, Melodrama. And she didn’t. Instead, she evolved. She created a collection of songs that were informed by the music that came before, that built upon that solid foundation, but grew into something new. Obviously, hotshot producer Jack Antonoff played a major role on this record, but his influence feels more balanced on Melodrama than it does on Taylor Swift’s new album. That being said, I think he also deserves a lot of credit for how well the album works. I like Antonoff’s own group, Bleachers, quite a bit. But Lorde’s Melodrama is the best album he worked on in 2017, and it’s number three on my list. At number two is one of my favorite artists, Ryan Adams. Prisoner finds Adams once again operating in the same Tom Petty-esque mode as he was on his self-titled 2014 album. It was hard to know what to expect on this 2017 release. After all, between Prisoner and the self-titled release, Adams had put out a full album cover of Taylor Swift’s 1989. He caught a lot of flack for that, but I have to say, I think it worked better than it had any right to work. Not that I’m hoping he’ll do a cover of Reputation next! On the contrary, I think he’s completely in the zone on Prisoner. So much so, in fact, that he released a deluxe vinyl edition that included almost 20 b-sides! And you know what? Those songs were pretty great too! Heck, if he’d released the b-sides as their own album, that probably still would have made my top ten! But that’s no surprise to Ryan Adams fans. He’s one of the most prolific songwriters working today. For as high a volume of music as he releases, it’s remarkable how rarely he disappoints. Finally, returning to the top of my annual best of the year list is Conor Oberst with Salutations. Back in 2014, I ranked Oberst’s Upside Down Mountain as the best album of the year. So, obviously I always look forward to new music from Conor Oberst. But when he put out Ruminations in 2016, it just didn’t click for me. The songwriting was great, but I wasn’t so enamored with his stripped down acoustic approach to the new music. It was a bold choice to record an album with such sparse instrumentation, but ultimately I didn’t find myself compelled to revisit it very often. Then, just five months later in 2017, Conor Oberst released another new album entitled Salutations. The album featured most of the songs from Ruminations, only now with a full band accompaniment. Now, I’m sure there are plenty of fans that loved what he did with Ruminations. But for me, when he revisited those same songs on Salutations… man, that’s what I was looking for! And you know, maybe I would have liked Ruminations more if he’d released that second, as a sort of unplugged follow-up. Regardless, Salutations was a truly solid effort that perhaps benefitted from the additional time it took to flesh out the songs he’d started working on a year earlier. And consider this: I was supposed to see Conor Oberst in concert a few months ago, but he ended up cancelling. I was really looking forward to seeing that show, so it was a huge disappointment. So… Conor Oberst calls off his concert and I STILL rank his album as best of the year? Yeah. It’s that good.